I didn’t sew a stitch last weekend and didn’t feel like it until mid day Sunday this weekend. Then, the sewing bug hit me *hard*. I finished up a blouse, repaired a dress, shortened a skirt, redid the waistband on my linen pants and finished up this UFO from January. Why so long? Well, I didn’t have navy or black thread in the serger. What can I say? My serger is the biggest determining factor in what I’m sewing next. It’s a navy (darker than pictured) poly double knit skirt and without central air in my house, it’s just too hot to model 🙂 The pattern is from the 12/09 edition of ‘Patterns’. This is a Russian language magazine that carries the Italian La Mia Boutique. It was a gift from my Ukrainian colleague earlier this year. I’ve since found a subscription online that I renew quarterly. Below, is the editorial shot and a bit of the line drawing. Again, a big shoutout to Lyl on the PR Boards for translating for me. I love, love, love this skirt. It’s totally unique from what I usually see. In case I haven’t said so here, skirts generally bore me. I like skirts with really interesting details so I don’t sew them too often. There are about three I would like to eventually make. 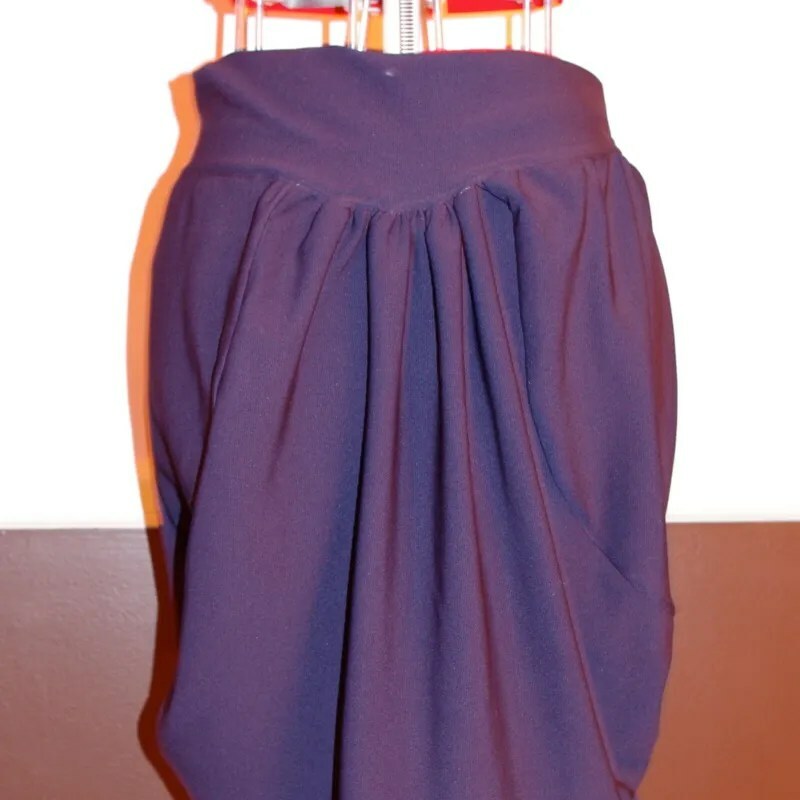 I shortened the skirt by about six inches since it fell way below the knee and lenghthened the side gathers so they draped more. I like that it’s not formfitting (knits and m thighs are not a good look). 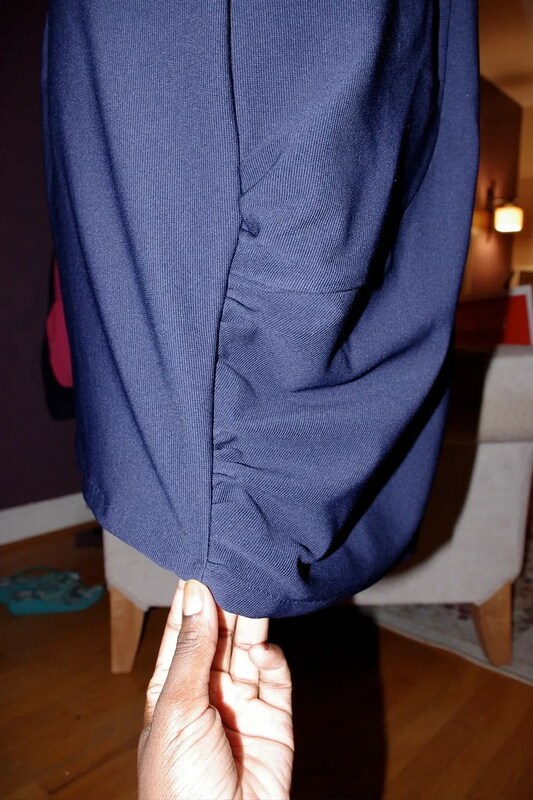 I was also able to omit the elastic in the waistband. The knit was sturdy enough to stay up without it. I’ll definitely make this up again when it’s cooled down in a wool. Ooooh, boots! I’m going to just love this skirt with boots. This gives me hope that my next four Russian La Mia Boutiques are as good as this one was. Do you like how my dressform is posing? Like I walked in on her while she was getting dressed, lol. Later this week (or better known as when I have a coordinating piece and wear it to work) I’ll show you my January 2008 #108 blouse. It came out all kinds of cute (tight in the biceps, but cute)! Technically, I think I’m done with my East Coast to Far East Capsule. I have three tops and three bottoms and one dress (dress and one skirt are pre-existing). If I can find some khaki linen this week, I might make another pants or a skirt. But, the pressure is off! Two more weeks to go! This skirt is so hip. It will look great with boots and perhaps a cropped jacket. Two fab garments! 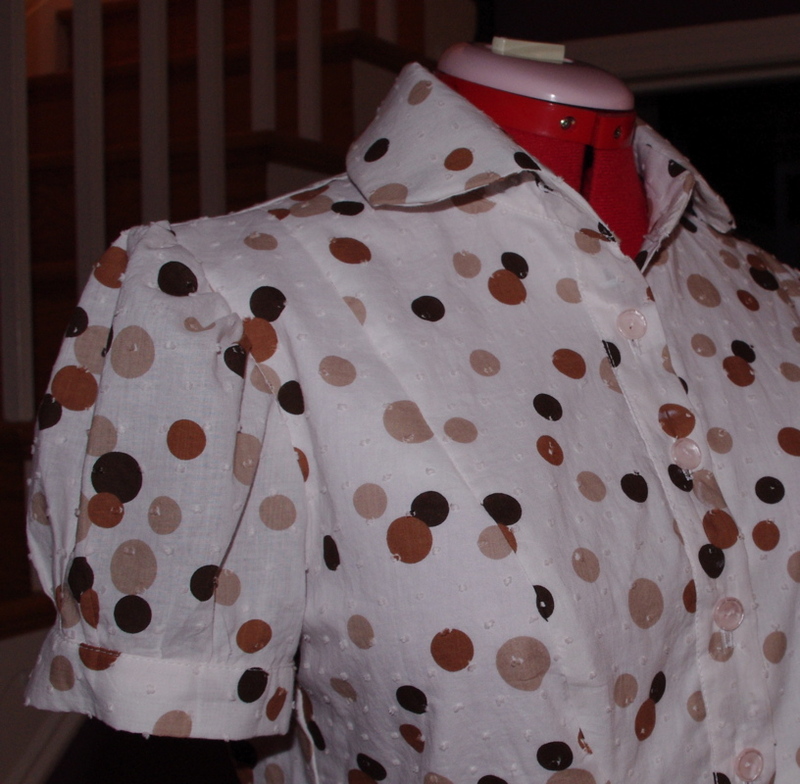 Oh, and I love the fabric of the blouse – I adore polka dots, but I don’t wear enough of them. I really should remedy that. That is a very cool skirt! Love the polka dot dotted voile, too. Love the skirt. It will be fun to wear. I haven’t heard of that pattern magazine before. I will start looking out for it if things are this cool in it. Great pieces! 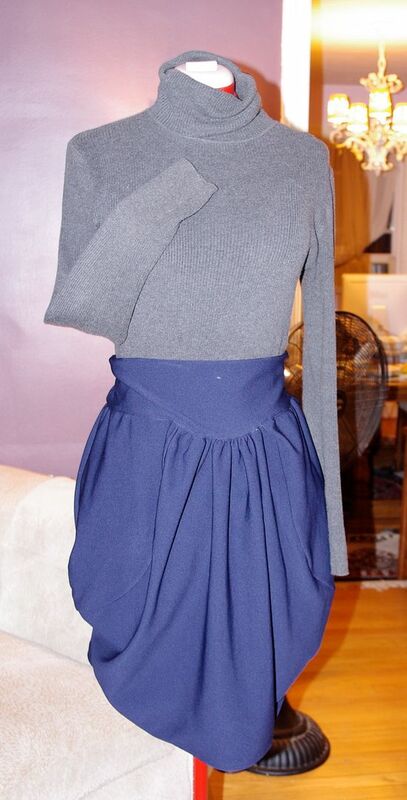 The skirt is really awesome! Oh, the polka dot top. Love it. That’s such a cool and current skirt. Love the draped look. I am looking forward to the top on you. Those polka dots are fabulous. OMG! That blouse is so stinking cute! 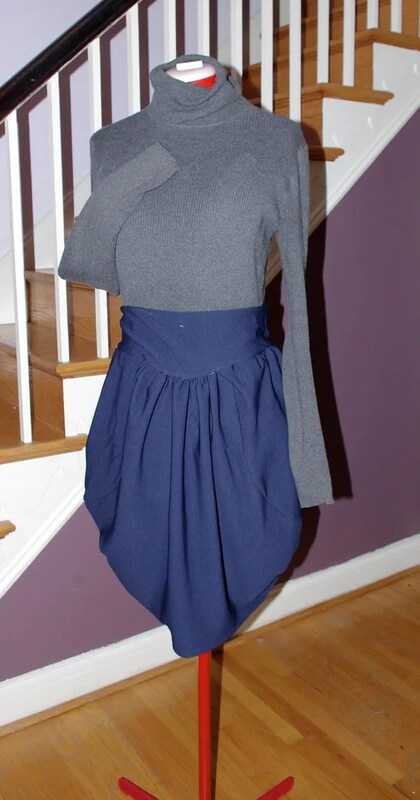 I see you finished the sleeves without my fabric. How’d you do it? I have this skirt pattern and have considered making it one day. I’d really like to see it on you! The skirt is wonderful. Agreed, very different. That is a SUPER cute skirt!! I can definitely see it in a nice wool jersey for Fall… And speaking of, it’s been in the low 60s here for the past week. Last night it was chilly enough that I half-thought about turning the heating on, until I remembered that it’s mid-August and that’s crazy-talk. I just thought you might want to know, as my sister-in-law is baking in Virginia right now and keeps asking me about the cooler London summers. I think she’s hankering for her vacation next month! Super cute skirt!! It would be super cute with boots for real! I plan all of my sewing around the serger thread. I have to be motivated to change colors. Yes, this skirt will look fab with boots! I want one! I love your polka dot top. It really is a great pattern. Totally love that skirt! Very funky and will be perfect to showcase awesome tights and boots. Although just typing that sentence has caused me to sweat. Great skirt, and very you! It looks really good with the sweater. Love the blouse preview, as well!